What is a Bully? It is someone who decides to take advantage of another person who they perceive as being vulnerable. The aim is to gain control over the victim through a deliberate methodology, ultimately to undermine the person, not alone in the environment in which they work or live but also to undermine the individual to a point where all self-esteem is eroded. Bullying in Families. 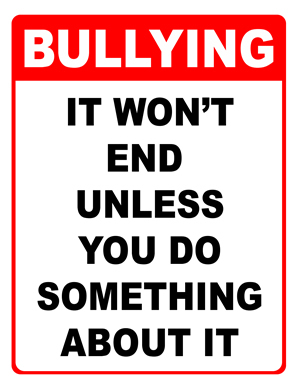 Bullying has existed as long as there has been human interaction. It was not fully recognised in society, it has been a part of family life between siblings, bullying here is very manipulative and subtle creating emotional damage and affecting future interaction with people and also affecting future personal relationships. Bullying in the Workplace. It has only recently been recognised by employers as a problem in the work place. Many employers do not know how to deal with the problem; they move the victim and leave the bully in place, creating the impression that the victim was the person at fault. Sadly in some cases, companies see employees who report bullying as weak and not suitable, many find themselves being offered to “consider exit strategy” and are quietly removed. We may be a bully and not know it. If a person has secured a successful role in their working environment through hard work and raw determination or they are high- achievers, there may be a distinct disconnect with those who report to them, and the only way the person believes they can manage these staff is to micro manage or too constantly critic them. Leading to constant stress and frustration for everyone.